In this U.S. election year, what information could be more important than the candidates' own words to describe their views, actions and platforms? In addition to providing voters with election information, we also hope to find out more about how people use speech technology to search and consume videos, and to learn what works and what doesn't, to help us improve our products. The gadget only searches videos uploaded to YouTube's Politicians channels, which include videos from Senator Obama's and Senator McCain's campaigns, as well as those from dozens of other candidates and politicians. It usually takes less than a few hours for a video to appear in the index after it has been published on YouTube. 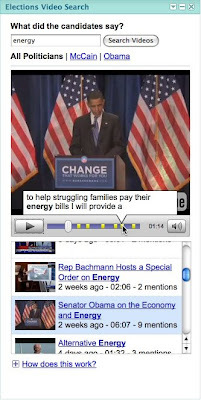 Candidates can control the videos that appear in the gadget by managing the content they upload to YouTube. While some of the transcript snippets you see may not be 100% accurate, we hope that you'll find the product useful for most purposes. Speech recognition is a difficult problem that hasn't yet been completely solved, but we're constantly working to refine our algorithms and improve the accuracy and relevance of these transcribed results. To try it out, just visit our iGoogle gadget page. We welcome your feedback, so please feel free to leave a comment while you're there.